THE BOOK that started the Gentle Revolution was How To Teach Your Baby To Read. 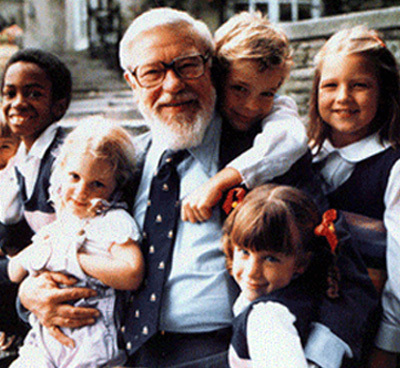 Glenn Doman founded The Institutes for the Achievement of Human Potential (IAHP) to which parents from every continent have been finding their way for more than a half-century. It is difficult to know if he and The Institutes are more famous for their pioneering work with brain-injured children or for their work in early development for well children. He dealt intimately with more than twenty-five thousand families over the last fifty years and strongly influenced millions of families through the book What To Do About Your Brain-Injured Child, and the creation of the groundbreaking Gentle Revolution Series of books and materials that teach parents how to teach their babies at home. Glenn Doman lived with, studied or worked with children in more than one hundred nations, ranging from the most civilized to the most primitive. He conducted expeditions to study pre-Stone Age children in Brazil’s Mato Grosso, Bushmen children in the Kalahari Desert and Inuit children in the Arctic. He also traveled to see children in the world’s major cities, from Johannesburg to Moscow and from London to Tokyo. He was decorated by George VI with the British Military Cross for outstanding heroism in action during World War II. He received the Distinguished Service Cross from the United States for extraordinary heroism in combat, the Silver Star for gallantry against an armed enemy, and the Bronze Star for heroism in close combat. He was decorated by the Grand Duchess Charlotte for services to the Duchy of Luxembourg during the Battle of the Bulge. In contrast to those decorations, he was knighted by the Brazilian government in 1966 for his services to the children of the world and received that country’s highest decoration, the Knight Order of the Southern Cross, and the Medal of the Italian Senate. His services to the children also won him decorations from institutions and groups in many other nations. His primary work continued to be with severely brain-injured children. He was nose-to- nose with “the finest parents in the world and the most heroic children,” teaching the staff and the parents better ways to make hurt kids well. He stated that his most prized possessions were the messages he would receive from mothers telling him of the joy they discovered in teaching their own children. These days, letters arrive from grandmothers too, telling of the lifelong benefits they have seen as the result of using his books when their children were young.